What’s the best way to get the most from Groundskeeper U? Log in and track your progress. While you can take advantage of the lessons at GU however you like, there’s no question the best way to approach it is to step through each module, lesson by lesson. You’ll gain the complete understanding you need for bringing the necessary skills to the field, and you’ll be in a great shape to get certified to actually prove you know what you’re doing. To gain certification from Groundskeeper University for 100-level modules you’ll need to have an account and have completed all 8 modules. If you’re a registered Beacon Athletics online customer, you’re already registered for Groundskeeper U. Just log in at GU using your existing Beacon account’s email and password. If you’re not already a Beacon customer just register for a free Beacon account and you’re ready to go. As a logged in GU user, you will have the advantage of taking a Pop Quiz at the end of most lessons that will help ensure you’re retaining the information as you go. Think of it as “final exam prep” on the fly. You’ll also be able to mark lessons complete as you work through the material, making it easier to come and go from GU as you need and always know exactly where you left off. When you’ve completed all 8 modules and marked each lesson complete, you’ll be ready to log in and try the Final Exam to gain certification. Remember, these 100-level modules at Groundskeeper U are absolutely free. 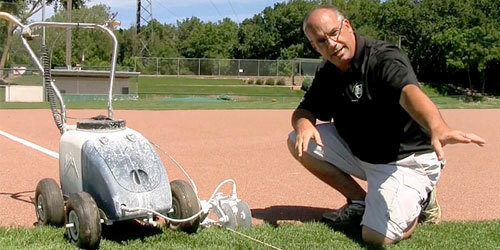 Consider Groundskeeper U your go-to resource for online training. Our goal is to bring professional training directly to your and your staff. But it has to be done right… Ballfields around the world will definitely be better for it. Good luck!